Update: This bug is fixed in upcoming JDev release. If you develop advanced ADF declarative components, I'm sure sooner or later you would face requirement to implement custom reusable popup. 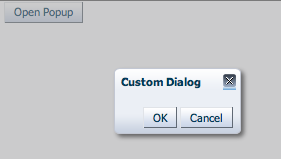 Ideally we would like to invoke custom reusable popup directly from button declared in the fragment or page. This works well on runtime, but JDeveloper 11g R2 IDE generates internal NullPointerException at ScopeIdAnalyzer - I will show how to workaround it. It works on runtime, but is quite annoying to get NullPointer exception each time when working with page/fragment in IDE. Workaround: invoke popup from declarative component programmatically. 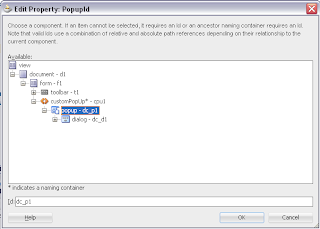 Download sample application (JDeveloper 11g R2) - DeclarativePopUpApp.zip. Thank's for very useful informayion. Can you have an example how to use reusable popup with on the button? Yes - you can download sample app from this post. Or you are looking for something different? I mean about button with af:showPopupBehavior tag, that invokes reusable popup. 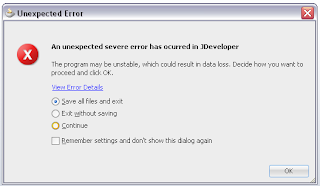 Bug is fixed in latest JDev release. Andrejus, in your topic in attached sample(DeclarativePopUpApp.zip) there is a programmatical variant. Can you have a sample with af:showPopupBehavior tag? You should check second screenshot and text - "Once we drag and drop such component into fragment or page, we can reference ADF popup from inside of declarative component by expanding customPopUp and selecting popup ID. This ID can be mapped with showPopUpBehavior tag to display popup on button click"
You should be able to expand declarative component and select popup. found your example just because wanted to implement reusable popup with ability to have facet inside popup. is it possible to build a reusable popup with facet inside it? So popup could be referenced from page or facet it is inserted into. Yes, i tested - it works to add a facet into reusable popup, it brings expand icon in JDEV 11.2.4.0. 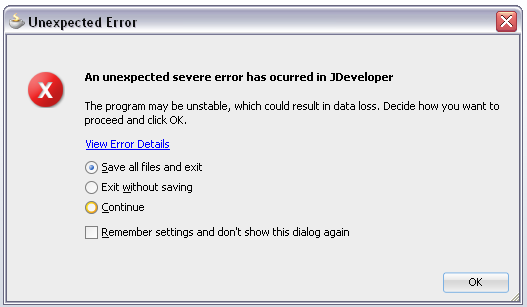 Just make sure to restart JDEV after you rebuild reusable component. actually in my requirement if we drag and drop user name from a table on to another table then popup should fetch ,in popup i should add a row or update a row .is it possible?